This has been a busy week on our ranch. 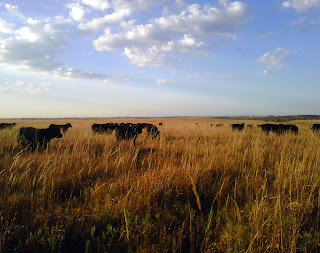 October marks the end of "grass season" on the Kansas prairie and it means cattle are gathered off the pastures and hauled by truck and livestock trailer or semi truck to winter pasture or other locations. The grass loses nutrition and the cows need more than pasture to keep them healthy. We raise approximately 300 heifers to sell as breeding stock to other ranchers across the nation. This week we loaded semi trucks with heifers destined to West Virginia and Missouri. The genetics of these heifers will determine the quality of beef on your plates in two years. Between coordinating the required veterinarian issued health papers for each shipment, to the actual gathering and loading of the trucks--the end of grass season is a busy time. The first picture on my post today is of a silhouette of a cowboy on a horse standing at the crest of a hill on the prairie. It is a likeness of a fellow who used to live here and managed thousands of acres of land through the years. He was a true cowboy in every sense of the word and had all the stories to prove it! 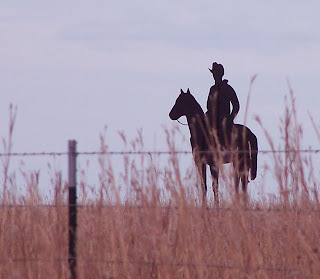 He is a bit of a legend in this area and it is very fitting that he now stands sentinel on the prairie, watching over those of us who now care for it and the cattle who live here. In every pasture you can still see traces of the past. 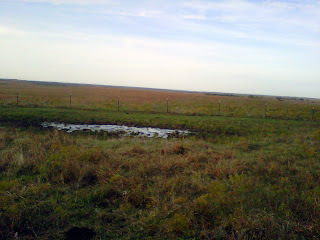 In this photo, the muddy depression is an old buffalo wallow--where buffalo used to roll in the dust and tear up a bit of the prairie. I don't know what drew the buffalo to this specific area, but it must have seen many bull buffalo over the years. Grass does not grow here, only weeds and you can see that it is a low place where rain water gathers. 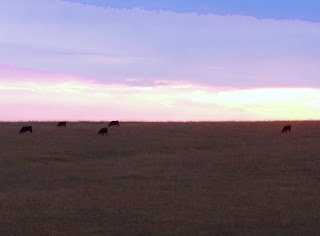 We have many buffalo wallows dotted across our pastures. Today the cows and bulls do not seem to use the wallows like the buffalo did, so they are merely a piece of history. History is important to us modern day ranchers, as we share a lot of the same beliefs with the cowboys of old. We believe that the land is to be cared for and nurtured; we want to leave it in better condition than we found it; and without good quality native grass growing in these hills, there would be no need for ranchers. What fantastic photos so romantic too! 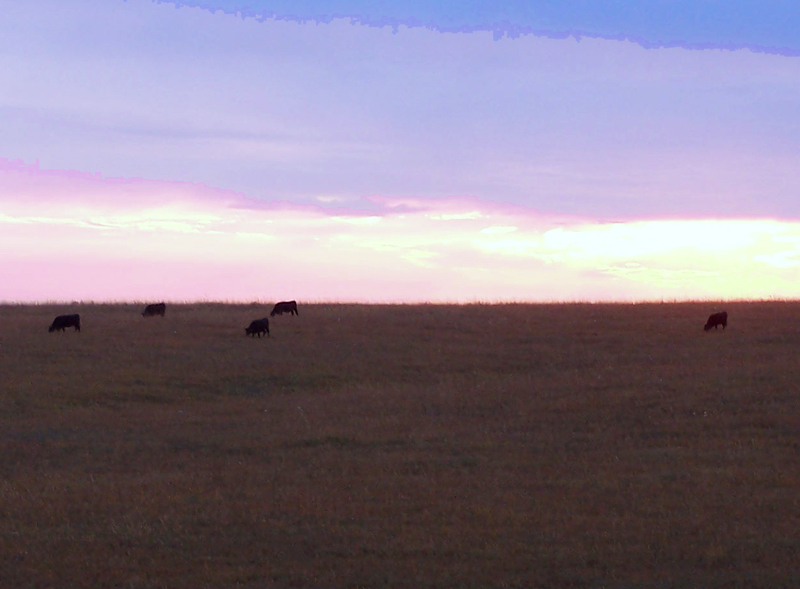 Your grasslands are so different than ours. Fascinating. Thanks for sharing. It's important for people to learn about ranchers who are caring for the tallgrass prairie. I was also glad to read about buffalo wallows. 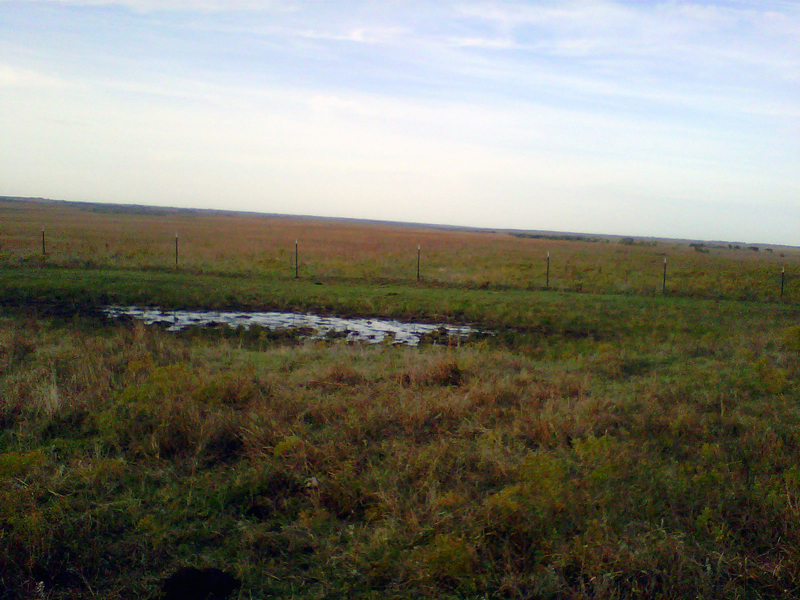 When bison were put back on the prairie at Konza Prairie Biological Station, they started using the same wallows that had not been used for over 150 years. I've driven past that cowboy many times. I always wish it was a real, live cowboy.